Regarding the disadvantages of an author partnership, it seems to me that forming an LLC (limited liability company) rather than having an informal partnership would cover most of the disadvantages. Wouldn’t an LLC provide protection against personal liability? The operational document could specify that obligations need the approval of both partners, and language in the agreement would take care of individual responsibilities and vague expectations, would it not, as well and work required for payouts, and also specify how the partnership would end should there be a disagreement. The big question I have is regarding taxes. If the partnership was a husband and wife filing a joint return (my situation), would the taxes be more difficult than a sole proprietorship? 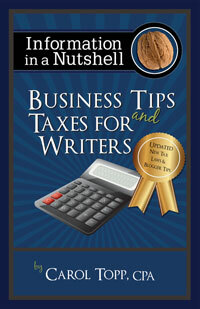 Tom is referring to some comments I make in my book Business Tips and Taxes for Writers where I discourage authors from forming business partnerships with co-authors. Nope. Here’s why: A limited liability company (LLC) with two members is still a partnership. An LLC can chose how it wants to be taxed. Single member LLCs are by default taxed as sole proprietorships. Two-person LLCs can be taxed as partnerships (most likely) or as a corporation, but that is less typical for co-authors. It is typically advisable for partnerships to have LLC status with their state for the advantages of limited liability protection, but I’m not giving legal advice. I’m a CPA, not an attorney. The issues you mentioned to put in the LLC agreement/operational document should be included in any well written partnership agreement. The reason I discourage author partnerships is because of the relationship issues that are sure to arise over money, marketing, who does what, and who gets paid how much. A good partnership agreement would spell all that out, but there are relationship issues that are difficult to foresee. A business partnership is like marriage. Your partner can spend the partnership’s money or obligate you to debt, just like in marriage! The tax return for a partnership/two-member LLC (even husband and wife) is significantly more complicated than a sole proprietorship tax return. For many years now the IRS has allowed a married couple to file a Schedule C as a sole proprietorship, so that helps significantly. My advice still stands. I caution authors against partnerships and two-member LLCs taxed as partnerships.